It may not always be a white Christmas, but it's always a bright Christmas around Big D– where the metroplex goes all out for the holidays. And for a perfect example, look no further than Prairie Lights, a drive-through holiday park that showcases one the most impressive Christmas light displays in North Texas. There's also nothing more enchanting than the magnificent gardens at the Dallas Arboretum– which celebrates the season with thousands of twinkling lights and elaborate Victorian gazebos filled with whimsical characters inspired by the story, A Christmas Carol. And if any place knows how to let the good tidings roll, it's Grapevine. 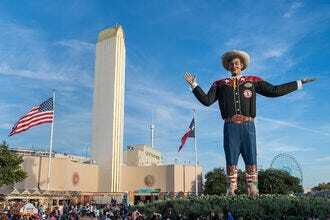 Dubbed the "Christmas Capital of Texas," this Dallas suburb boasts a wide variety of holiday events and attractions, including the largest lighted Christmas parade in North Texas. We're just getting the party started, there's lots more seasonal fun to be had. From street festivals to Santa chats to snow hills, keep reading–10Best has your ultimate holiday spirit checklist all wrapped up. Over 175,000 lights choreographed to music set the scene for Frisco's annual Christmas in the Square this year. 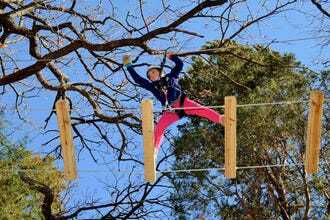 And there's a sack-load of festive fun planned as well, including carriage rides, an outdoor ice rink, an enchanted Christmas tree maze, a trackless train rides, live entertainment and even a parachuting Santa. The yuletide celebrations run daily from 6 to 10 p.m., November 23 through December 31, 2018. 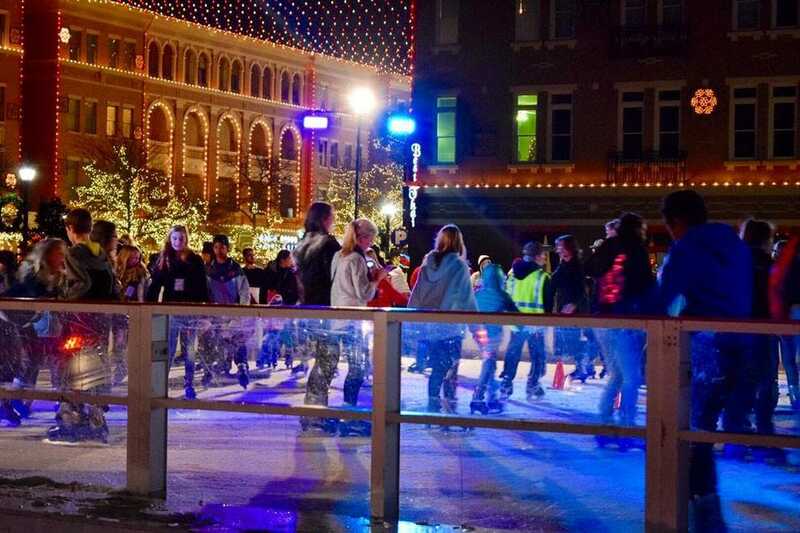 The skate rink will be open from November 23 through January 7 (except on Thanksgiving and Christmas). 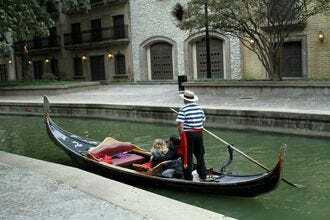 Admission is free, though some attractions require a fee. 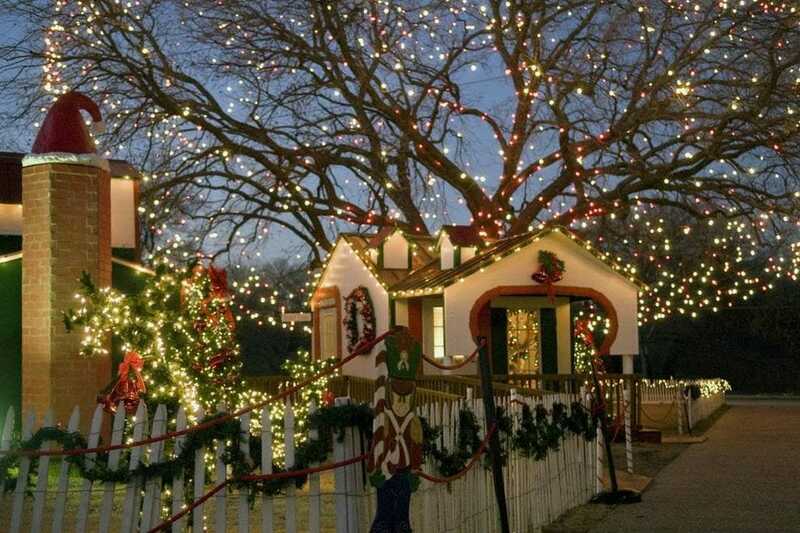 During the holidays the lawn next to the Richardson City Hall gets transformed into a dazzling Christmas village-- complete with walk-through, gingerbread-style houses featuring a variety of fun-filled activities for kids to participate in. And that's just the half of it. There's also a miniature train, Santa photo ops and nightly performances by local choirs, singers, musicians and dance groups. Better yet, the entry is free. The only drawback is that it's extremely popular, so expect to be braving some serious crowds. The fun begins December 1 and runs on Friday, Saturday and Sunday nights through December 16, 2018. 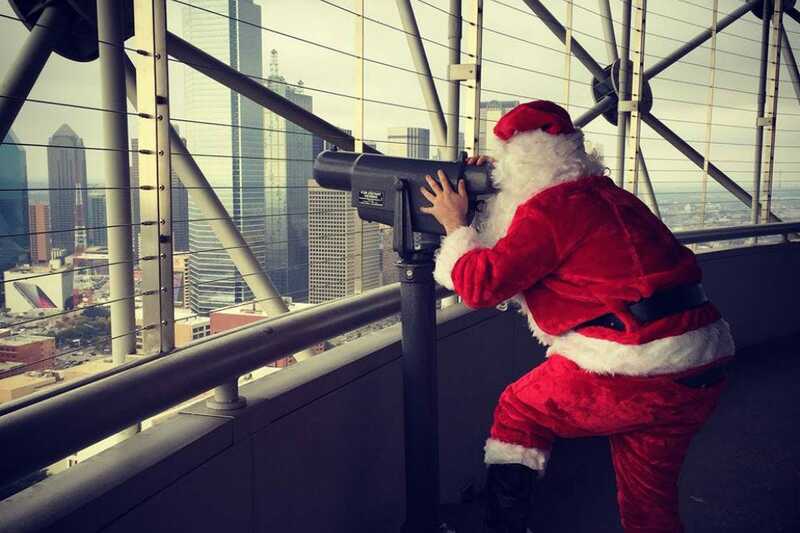 Of course, anytime is a good time to visit the city's most iconic landmark, but Reunion Tower's sky-high viewing platform becomes even more merrier at Christmastime. From November 24 to December 22, 2018-- the GeO-Deck will be featuring a slew of fun events, ranging from Ugly Sweater Bingo (December 11, from 7 to 8:30 p.m.) to encounters with furry friends from the Dallas Zoo (December 2, 7, 9 and 14 from 11:30 a.m. to 12:15 p.m.). There will also be kid's crafts and tasty treats at Cloud Nine as well as photo-ops with Santa and his elves (Saturdays from 12 to 3 p.m.). All the festivities are included with general admission tickets ($17 adults/$14 seniors/ $8 children ages 4-12). 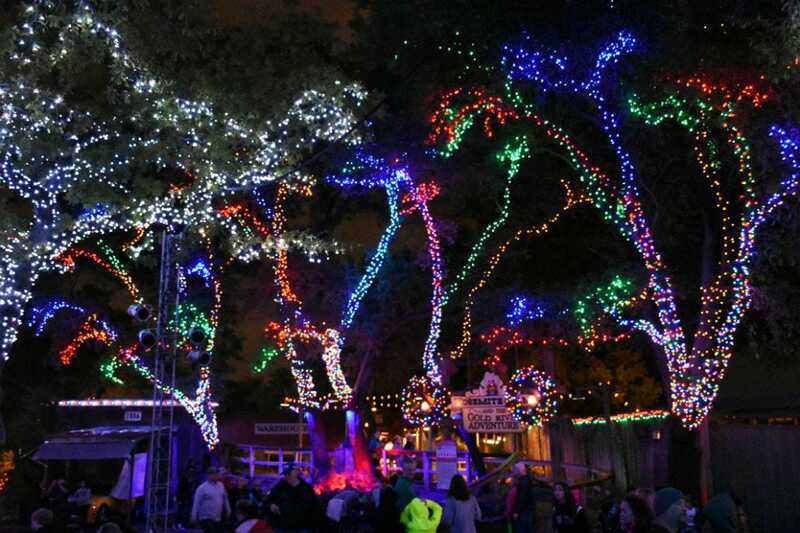 Make the season even more magical for your little ones by heading over to this after dark holiday experience at the Dallas Zoo. 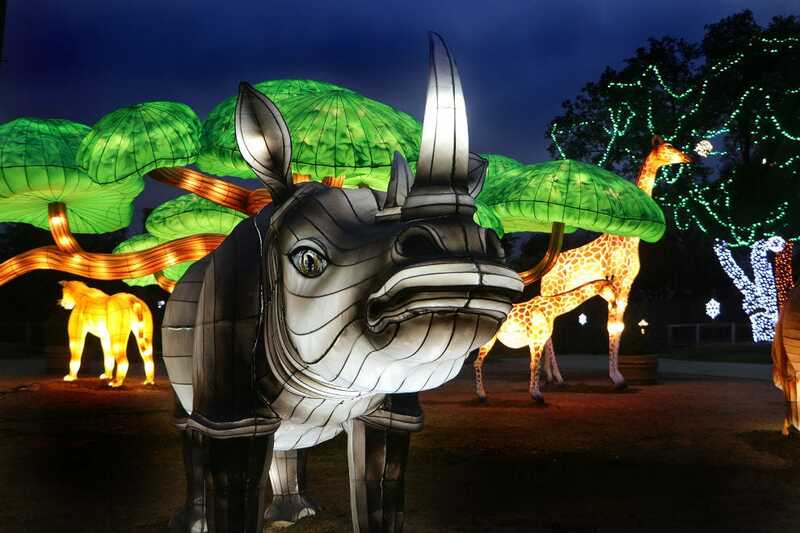 While the zoo's furry friends snooze, wild animal light sculptures and over a million sparkling lights will ping into action, illuminating ZooNorth throughout the season. Along with light shows and nightly musical performances, guests can enjoy everything from ornament-making and scavenger hunts to animal encounters, holiday photos stops and Santa meet and greets. There will also be a carousel, mini-train rides and holiday treats on offer. 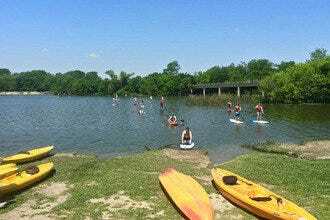 The event takes place every weekend as well as select weeknights from November 16 to January 1, 2018. Check the website for dates and times. 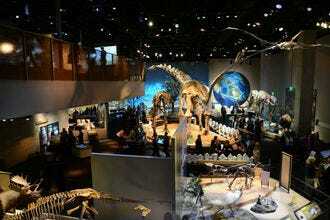 General admission to the zoo is $15 for adults (age 12-64) and $12 for children. Pro tip: Come before 4 p.m. to enjoy the animals, then stay for holiday festivities at night. Millions of twinkling lights, thrilling rides, live performances, plus visits with Santa are what you'll find at Six Flags amusement park's massive tribute to festive fun. This year's Holiday in the Park features everything from a spectacular lineup of seasonal shows to a Christmas train ride and a racing hill made of snow. Along with the tallest steel hybrid roller coaster in the world and an assortment of rides to keep thrill seekers of all ages happy, expect to find reindeer dance parties, choreographed light shows, Christmas crafts, holiday karaoke and s'more cookouts around a real campfire. The park is open on weekends as well as select days during the week between November 16 and December 30, 2018. This Christmas season, Arlington's Globe Life Park is going to be even more festive with Enchant, a Texas-sized holiday festival featuring everything from Santa appearances and a Christmas artisans' market to an ice-skating trail and over 2 acres of lighted displays. Expect to also find holiday-themed food and drinks as well as nightly live music and entertainment. 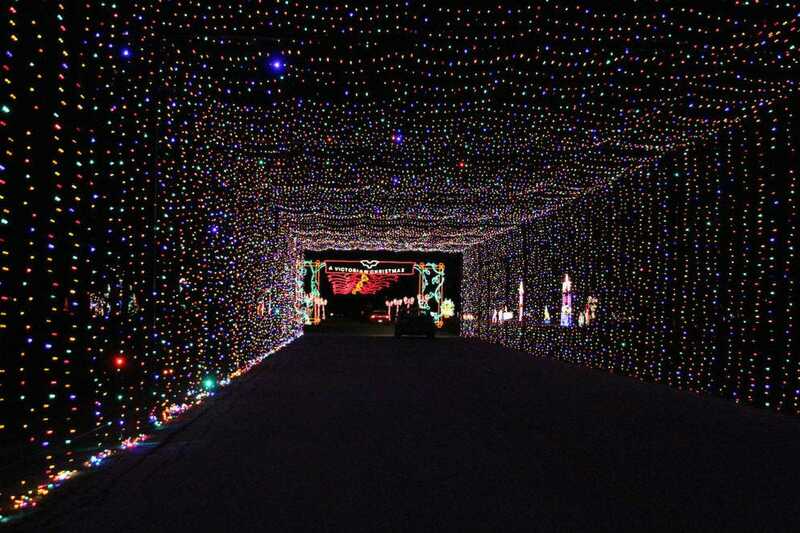 Oh, and speaking of light displays, Enchant is home to the world's largest holiday light maze. The festivities begin for the 2018 holiday period on November 23 and run through December 30. General admission tickets start at $19.99. Check the website for additional pricing options. 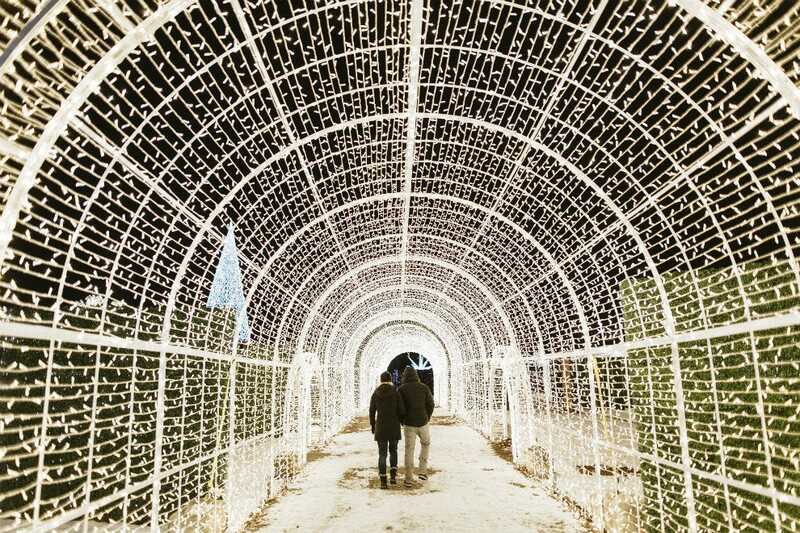 If you want to see as many lights as possible, this twinkling drive-through wonderland in the Dallas suburb of Grand Prairie never disappoints. Every year, folks pile in by the carload ($35 per car during the week and $45 on weekends) to cruise through four million lights and hundreds of custom displays set along 2 miles of path. The park also features a holiday village where you can hang with Santa; refuel with hot chocolate and snacks; enjoy an indoor laser show and trek through a lighted walk-through forest. And as if that weren't enough, the place boasts the world's largest animated light tunnel at the end of the drive. The park is open nightly (6-9 p.m. Sunday-Thursday; 6-10 p.m. Friday and Saturday) from Thanksgiving night until December 30, 2018. Though anytime of the year is magical at the Dallas Arboretum, this stunning 66-acre acre oasis becomes even more enchanting during the holidays when it undergoes a magnificent seasonal makeover. 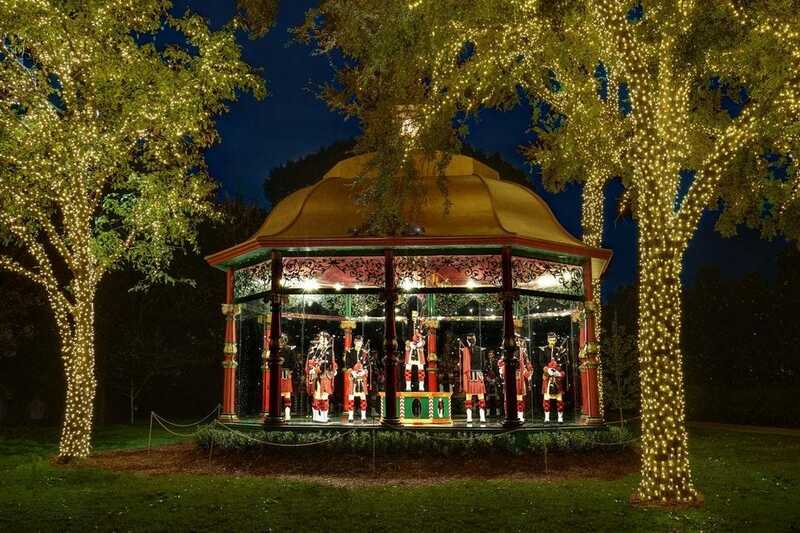 Along with over 500,000 lights illuminating the gardens, the Arboretum is bringing back its ever popular 12 Days of Christmas, an outdoor exhibit featuring twelve illuminated Victorian gazebos filled with elaborate scenes and whimsical characters. Meanwhile, the historic DeGolyer House will be decking the halls with 500 créches from over 50 countries, all part of this year's "The Artistry of the Nativity" exhibit. Also expect to find Santa sightings, musical performances, live reindeer, a holiday market and an assortment of activities geared for the entire family. Holiday events run from November 9 through December 31, 2018. General admission ranges from $10 for children (ages 3-12) to $15 for adults. 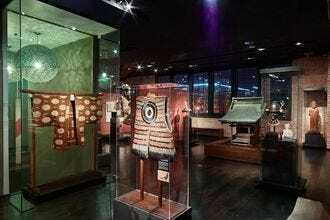 Additional discounts are available on the venue's website. 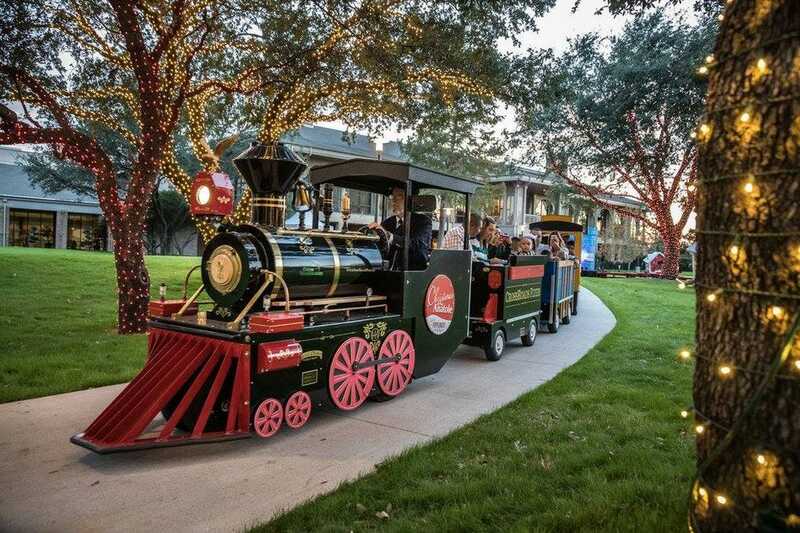 When it comes to getting folks into the ho-ho-holiday spirit, few places do it better than the Dallas suburb of Grapevine (AKA: the Christmas Capital of Texas). Beginning Thanksgiving weekend, the downtown area will transform into a magical dreamland filled with huge decorations and millions of twinkling lights. 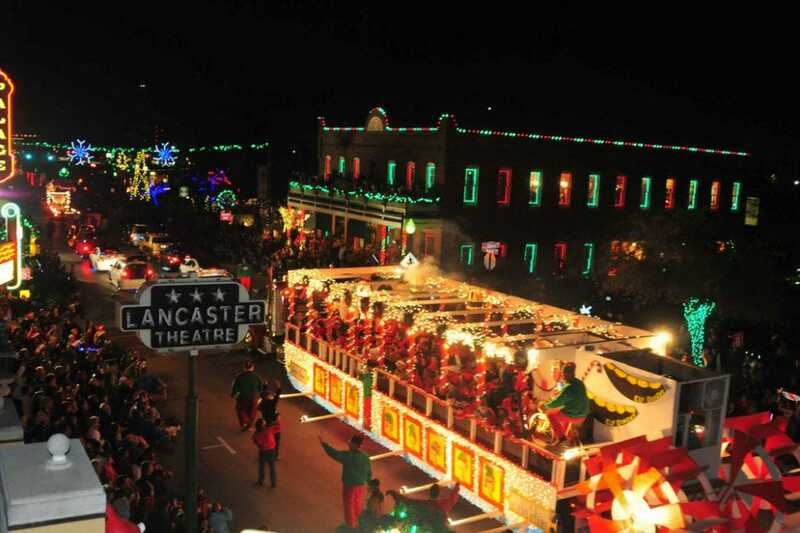 Expect to find over 1,400 daily events and activities, ranging from live street performances and tractor-drawn wagon rides to choreographed light shows, strolling carolers and parades. 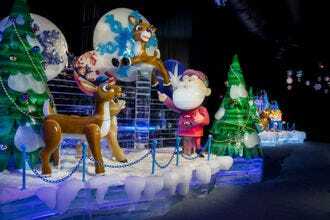 Additional holiday fun can be found at the Gaylord Texan Hotel where visitors can stroll through 14,000-square-feet of hand carved ice sculptures at ICE! as well as enjoy everything from snow tubing to ice skating. Did we mention that Historic Downtown Grapevine has more than 80 locally-owned shops, boutiques and wine tasting rooms? Be sure to check the website for the full schedule of all the events going down this season.